CoolWallet S Review – Is CoolWallet S Legit? | Are These Products Legitimate? CoolWallet S Review – Is CoolWallet S Legit? “If you don’t own your private keys, you don’t own your crypto”. People say this very frequently in the crypto world, because it’s very precise, if you keep your crypto in exchanges you do not own the private keys of the crypto you keep there, the exchanges do. We do not need to remind you what happens to the funds of exchanges that got hacked like Mt.Gox, Coinrail, Bithumb, Bitfinex, just to mention a few. The motto on their website is “The ultimate Bitcoin Wallet”, we would change this motto to “The ultimate secure and mobile Bitcoin/Crypto wallet”. CoolBitX’s CoolWallet S is a revolutionary mobile cold storage hardware wallet for your Bitcoin, Litecoin, Ethereum, Ripple, Bitcoin Cash, and ERC20 Tokens. Custody over your cryptocurrency investment has never been more protected or convenient to use. Quickly store and send your coins at any time, any location, and with anyone you want. 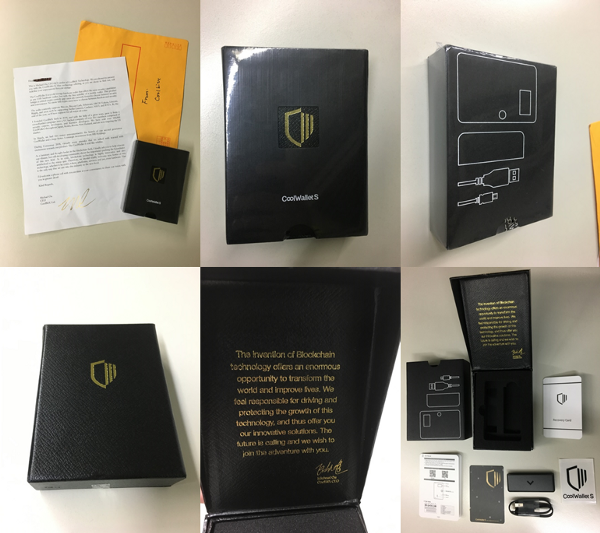 We opened my DHL package and found the CoolWallet S box and a letter written by the CoolbitX CEO Michael Ou (nice touch). Felt exactly as when we unboxed our Iphones, excited! Within the box you’ll find CoolWallet S, charger, cable for charger, manual, seed recovery log, and a sticker. How Is Coolwallet S Different From Other Hardware Wallets? First thing it caught my attention, was the size of it, it is exactly the same size of credit cards, even the thickness. We could never imagine so many components could fit in a credit card sized device. CoolWallet S has inside a secure element, button, Bluetooth antenna, e-paper display, rechargeable battery, and a printed circuit board. How they managed to put all those components inside it just blows our mind. Initially you would have to put the card on the charger, download and install the CoolBitX Crypto App on your mobile, and pair it through Bluetooth. 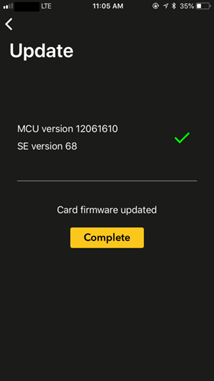 First you are prompted on the app to update the cards firmware to the latest version, for me it took us 5 minutes, and had to do nothing, only wait. Compared to my experience with Ledger Nano S, where we had to figure stuff out by myself since, updating the firmware and installing apps to the device and your computer you are using it on, is not the best UX to be honest or intuitive. Then came the part to create a new wallet, as we’re paranoid, we decided to pick the safest option the 24 numbers seed. You have also the options for 12, 18 or as mentioned the 24 numbers seed, and the bigger the length of numbers in the seed, the safer. Which Cryptocurrencies Can You Store And Use On Coolwallet S? 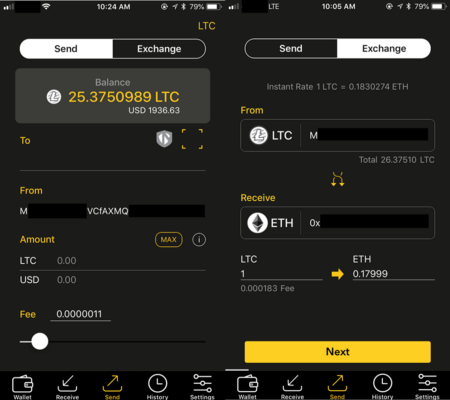 On the app by default you have Bitcoin, Ethereum, Ripple, Litecoin, BCash wallets enabled. 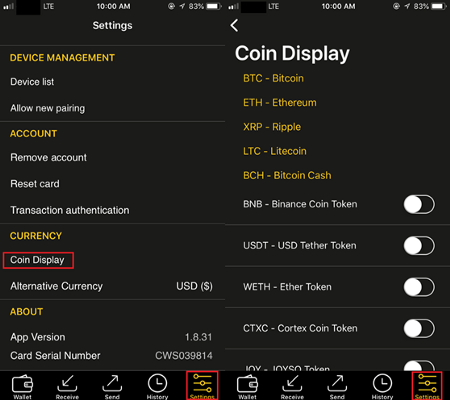 If there are cryptos that you do not see listed on the Wallet, one can easily add them if available on the app by accessing Settings > Currency > Coin Display. Once CoolBitX starts supporting new cryptos, these will be added here. One cool thing is that you don’t have to install anything in order for CoolWallet S unlike Ledger Nano S, just turn it on. Accessing the Receive tab, intuitively you have the option from a drop down menu to choose the crypto you want to receive, from the coins you have enabled. On the header you have the code bar of your address and under the address itself. By the code bar itself, this is the fastest way if you are sharing your address to someone else’s mobile phone using the code bar scan functionality. Through the copy paste button, copy in the CoolBitX, and in whichever application you want to paste the address. Or using the share button, here you can share to the applications you have installed on your mobile, in our case: Whatsapp, email, Twitter, Discord, Telegram, Signal, and so on. 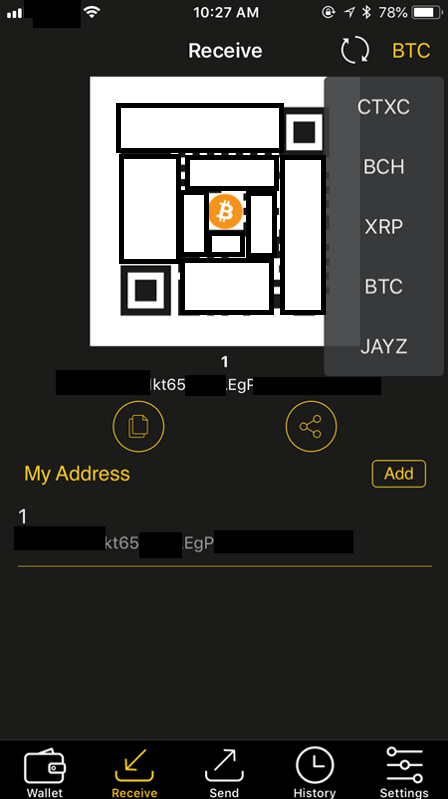 Same as Receiving crypto, to send you have the option to pick the coin you want to send with the drop down menu. Two ways to input an address to send cryptocurrencies, by pasting the address or scanning the code bar of the address. CoolBitX recently announced and implemented MetaCert Protocol, what this means is that CoolWallet S hardware wallet users are now protected from fraudulent address schemes. Another dope feature CoolWallet S has, is the transaction fee slide bar, which automatically tabulates the fee for you depending how much you willing to pay as transaction fee. Or you could manually input the fee you are willing to pay, this is helpful for advanced users, who wishes to pay a higher fee than usual for its transaction to be processed as soon network of the coin allows it to. Shapeshift is also integrated into CoolWallet S, it basically allows the user to quickly trade a specific coin they own to the ones Shapeshift supports at market value. The success of Coolwallet S has given rise to many frauds who try to sell their own products in its name. This is a big issue as many customers have lost their money in joining from such fake sites. It is advised that customers should be really careful when they are subscribing and should do some research before they join any website. To spot these, watch out and avoid sites that claim to write about Cory Mitchell’s Coolwallet S, yet the writeup is completely garbage as they are created by software and spammed all over the internet. It is always better to avoid buying from any other website other than the official one. Therefore, it is highly advised that consumers do careful research, or only buy join the site from the official website here – http://CoolWalletSOfficial.com/ (link opens in a new window). The official website that they have includes the legitimate product. In our experience within crypto, we would say with a Trezor or a Ledger, one could not go wrong choosing either, both are really safe, both also have 2FA and the Trezor has Password Manager support. But being entirely honest, they are not really as practical as we would want them to be, what if you do not own a laptop, what if the work laptop you use does not let you install apps on Chrome or any sort of application? Everybody nowadays has at leasta mobile phone (smartphone), EVERYBODY. So using a CoolWallet S you don’t have a barrier entry, this is a more practical hardware wallet everybody would like to have that we can certainly highly recommend. Previous PostPrevious XFunnels Review – Is XFunnels Legit? Next PostNext Lean Belly Secret Review – Is Lean Belly Secret Legit?